Watching Super Fly decades after its theatrical run, it could be easy to fall into a trap of treating it as high camp, what with its almost cartoonish slang, dated (yet awesome) fashion, and the most ostentatious Cadillac Eldorado ever committed to celluloid. But doing so would miss the coke-game forest for its wide-lapel trees. That probably doesn’t make any sense, but Super Fly remains great 40-plus years after it became an unexpected and controversial hit. The story follows the familiar “one last score” trope common among crime films, as successful cocaine dealer Priest (the fantastic Ron O’Neal) plots his way out of the life through one final campaign: buy 30 kilos of top-quality blow with the $300,000 nest egg he and partner Eddie (Carl Lee) have accumulated, sell it over the course of four months, then leave the drug game forever with $500,000. Priest’s plan is further complicated when his connection, an ex-dealer named Scatter (veteran actor Julius Harris) draws the attention of crooked cops. They don’t want to stop Priest—they want to supply him. Keep dealing, and Priest and Eddie will have a steady supply and police protection to make more money than they ever have. Unsurprisingly, Eddie wants in, but Priest steadfastly refuses. The cops don’t plan to give him a choice in the matter. 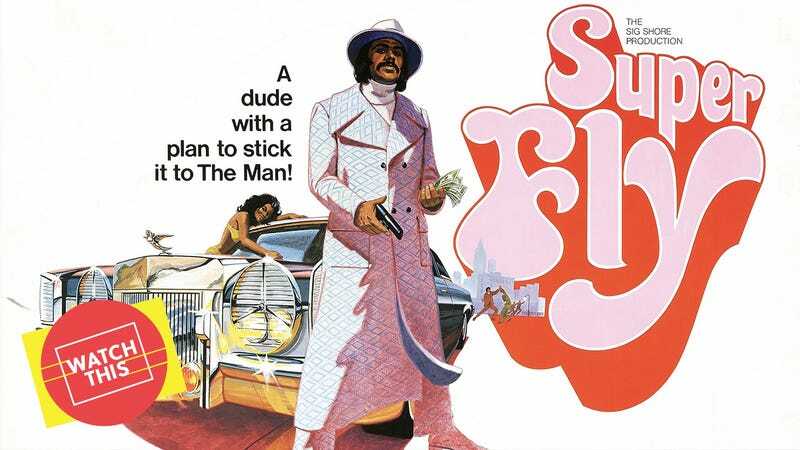 Briskly paced, stylishly assembled, and complemented by one of the greatest soundtracks of all time (Curtis Mayfield’s songs are probably better known than the actual film), Super Fly is surprisingly grim. With his eye-catching clothes, women, flamboyant car, and steady coke habit, Priest looks and lives the part of the flashy pusher man, but he realizes it’s a trap like everything else. Ron O’Neal was a struggling stage performer when he developed the treatment of Super Fly with screenwriter Phil Fenty, who promised O’Neal the starring role. Traces of O’Neal’s life can be seen when Priest interrupts a dice game. Pissed, one of the players says he looks white, and Priest immediately punches him. O’Neal’s light skin and naturally straight hair repeatedly made him lose out on black parts—including the lead role in Shaft—because he wasn’t dark enough. The film was independently financed and had a minority-dominated crew, unusual for films at the time (and, well, today). Gordon Parks Jr., son of Shaft director Gordon Park, took it on after working in the fashion industry and as a camera man and a still photographer for films like The Godfather. His background in photography is obvious during a still-photo montage toward Super Fly’s halfway point: Triptychs and full-frame stills follow Priest’s coke being sold to people from all walks of life, including a construction worker and black executive. Priest flouts the system at every opportunity, and ends up using the system against itself. Super Fly’s climax finds him taking an unexpected way out—it’s not the clean break he wanted, but getting out never is. Availability: Super Fly is available for rental from most major streaming sites. It can also be obtained on DVD or Blu-ray from Netflix, Amazon, or possibly your local video store/library.